Within easy distance of Calais and Dunkirk ports, this site is both a handy stopover and a convenient base for discovering the sights of the Somme. Families staying a little longer will find plenty to occupy them in high season, from a recently renovated pool complex, a games room and mini-golf to organised entertainment and pony rides. The pitches are well-sized and private, being separated by hedges. Nature enthusiasts and bird watchers will enjoy a trip to the Le Marquenterre reserve, which is visited by over 300 species during the course of the year. Surrounded by countryside and fields, the site is just 30 minutes from Abbeville, which suffered extensive damage during World War II and has some interesting monuments. From the A16 take exit 24 (Crécy en Ponthieu/St Valery s/S), then follow signs to Rue on the D32 as you approach Rue follow the signs to Le Crotoy/ Saint-Valery-sur Somme on the D940. After passing over the river (bridge) take the 2nd exit at the roundabout (Le Tréport). At next roundabout take the 4th exit then immediate left and follow brown/white signs to the site. How the standards have fallen since we last stayed in 2005. We stayed on two separate occasions this year and in our experience, this is a poorly managed site both in staff and site management. (June 2018) I believe that the site management are only focused in selling and renting residential cabins. I estimate that 85% of this site is now residential cabins. Turning this facility into some sort of holiday park/camp. 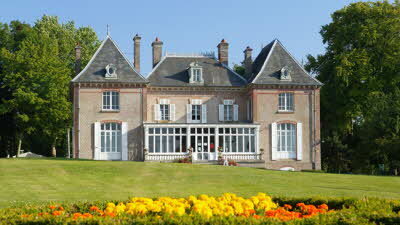 We used this site as a stop over on our route travelling to and returning from the East of France. We stayed seven nights in total. Stay 1 – (2 nights). We requested a pitch with sun but were informed, our pitch was selected for us by the Motorhome & Caravan club therefore they could not change it! All the vacant pitches were pre-booked. Our pitch was in shade and next to the occupied residential cabins on site. We were also told that the only toilet block we could use was the one next to reception (old and tired) the others were being refurbished. The pitch we were allocated was at the other end of the site with a modern toilet block which had locked doors to the shower area and a sign on the door stating it was reserved for rally. 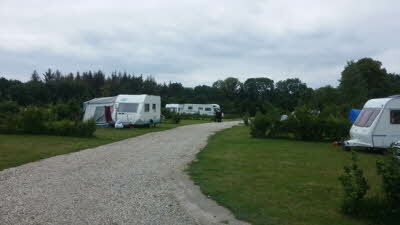 We used our caravan facilities on this stay which was the only way we could obtain hot water and a hot shower without walking the length of the campsite. There was another refurbished toilet block half way to the reception but this was boarded up. This was not a peaceful or enjoyable stay as the residents in the cabin were quite noisy. 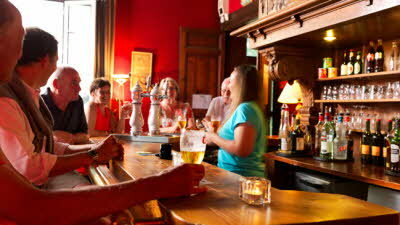 Stay 2 – (5 nights) – We arrived when the reception was closed and surveyed the vacant pitches. The same young girls were staffing the reception. This time I informed them which pitches were available and acceptable to us. After a small debate we secured an acceptable pitch. We also observed that the closed and reserved toilet blocks were now fully operational. Unfortunately our stay spanned the weekend of the 16th & 17th June – The Transbaie Race. The site had competitors who were camping and booked into the residential cabins. A large group. On the Friday evening, using their sound system, they partied until 1 am with a wood barbeque that had flames extending to 2 meters. There was so much inconsiderate, tactless and selfish behaviour we did not feel safe. We complained and were informed the competitors had been given permission for these activities by the site guardian. What management team would allow of selfish irresponsible behaviour? There is a complete lack of supervision in the pool area as well. Poor hygiene, no reinforcement of the pool guidelines regarding patron’s safety. I observed young men on their friends shoulders wresting each other in the covered pool, while others children were trying to swim. 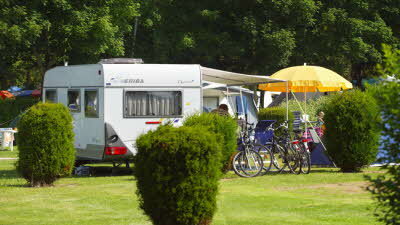 The Caravan Club really need to review this site to remove it from their European Campsite Catalogue. There are other sites in this area that I will use in the future. Members planning on staying here should think very carefully. Don't go there - stay in an Aire! Stayed here for one night June 2018, and having read the previous review I thought it would have been a one off! How wrong were we! It may look grand on the website, but this isn't the case! Firstly the site we booked and paid for costing nearly £40 a night, was a Grand Comfort pitch - with hook up water supply and grey water drainage - we were given a pitch that I could say was no more like a builders rubble yard with long grass on, no hook up or water in site. There was no number on this pitch so went to check, and yes this was our pitch, so asked for another with the correct facilities - The staff were rude, and guess what started talking about me in French saying what is "her problem etc", I played the card of I couldn't speak or understand little French, but I knew EXACTLY what they were saying, and could quite easily have joined in in full French! We were eventually offered 2 other pitches - but not what we booked only hook up - no water or waste, and yet again it was on a pitch that clearly had been used for dumping rubble, and was overgrown - by this point the kids had had enough and wanted to go in the pool, went to go and try to sort this out once more but vola the reception was closed (not the time that is advertised on their website!). So trying to make the best of it took kids to the pool - well dirty was an understatement, no footbaths, people walking in all sorts on their feet, no working showers, and as you know in France their is stick bathing wear - well it wasn't here - one lady was clearly in the pool in her sundress! It wasn't at all heated so kids were out in around 10 mins. Also the pool was due to shut at 5.45pm - think this was for the "british", as clearly there were "non-English" in the pool until was past 8pm! So off we went to find the "football" pitch! Find was a clue.... the grass what approximately knee length, and someone had parked their caravan slap bang in the middle of it! Kids were thinking it would make a good goal side, but I did have to stop them.....so back to the pitch. To be fair the toilets were "cleanish", not enough of them for the size of site, only one block open and the site must have been over half full - dread to what think what it is like in high summer. 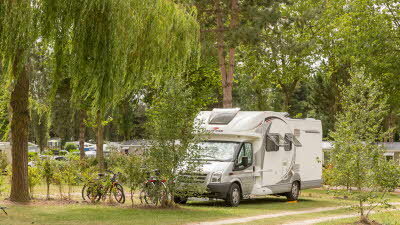 Seriously I think the caravan club should go undercover here and see for themselves what the place is like, and how they get treated - there are plenty of local Aires and other sites which we wished we had used. We eventually left early as I cut myself on some of the rubble on our pitch and went home early (yes left a 10.30pm at night!) - of which Eurotunnel were lovely and accommodating. We are sorry to read that you didn’t enjoy your stay here and please be assured we take your feedback seriously and have forwarded your comments to the site for their reference. We have also instructed our site inspector to visit the site. He has reported that most site facilities were functioning and operational during his visit, notably the covered swimming pool, bar (Drancourt café) and restaurant. The only sign of any building work on his visit was some improvement work to one of the wash blocks. This work was, however, in its final stages. He reported that pitches were of a good size and there was no building rubble during his visit. As it’s the low season, some cabins in the wash blocks were not in use (this is quite common). Please be assured that we inspect all sites that we work with regularly and always provide feedback for improvement. We stayed at this site a couple of weeks ago for 3 nights at the start of our holiday and had a great time. 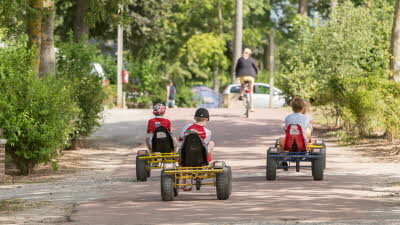 It's really easy to find, the staff are really friendly, and my 3 boys absolutely loved the swimming pool and play areas and via this made some friends that they plan to keep in touch with. My only slight negatives are (1) the pitch, whilst nice and big for a 27ft tourer and separated by hedges and trees making it nice and private, was quite slopy and try as I might using my motor mover I struggled to get it level, and (2) the toilets didn't have any soap in them, but that may just be a French thing! This was our first stopover after a lovely afternoon in Montreuil having travelled from Calais. There is virtually no signposting to help find your pitch, there are limited facilities for motorhomes and the roads are very bumpy to access the water and chemical toilet waste etc. The grass needed cutting and we had flowers on the clover on our site! 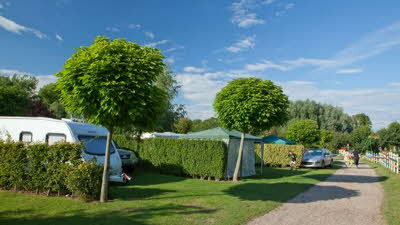 The pitches aren't very big and not separated by trees etc as in our other sites. We were only here for 1 night and it was functional but we didn't enjoy it. 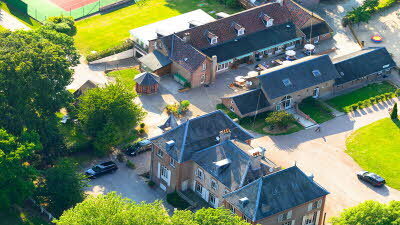 It's a very good location and the facilities were ok - there looks to be a great swimming pool but we didn't use it.